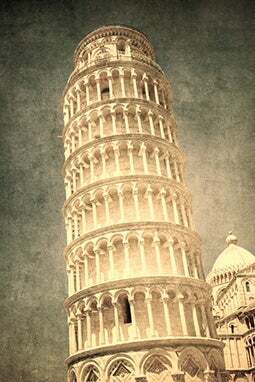 This eight-story circular bell tower in Pisa, Italy, is famous for its obvious tilt to one side. It was designed to be perfectly vertical, but something went wrong during the construction, which began in 1173. Because of a series of wars in that region, the building took about 200 years to complete. There are 15 marble arches on the bottom story and 30 arches on each of the next six stories. The top story, with 16 arches, forms the chamber for the seven bells. Restoration work in the late 1900s reduced the degree of leaning to 3.97 percent, which means the top of the tower is almost 13 feet off center. Previous to the restoration, the top was close to 15 feet or more from where it should have been. There is a lot of controversy over who was the real architect of the tower. The man many thought was responsible for the design always signed his name to his work, but there is no name on the tower. In view of the outcome, perhaps he was too embarrassed to take credit!